I feel like I’m missing something by not exhibiting at trade shows, and not just the sales. From this distance they look like mini reunions and in a city like New York, great opportunities to get together over great food. For now it will have to suffice that I meet up with fellow Fair Trade Federation members by email (and of course at the 360o FTF Conference in March!) But if you’re heading to NY NOW February 4-8, here are some more FTF exhibitors to add to your Fair Trade scavenger hunt. I’m always so impressed with organizations that go through the effort of importing children’s products and Kahiniwala does it with aplomb with their partner Pebble. “Pebble’s Transport Collection is growing in 2017 and now includes these fabulous crochet Airplane Rattles,” writes Austin (or maybe Marita, it’s hard to tell in an email.) “A perfect toy for the little one who is fascinated with things that move! 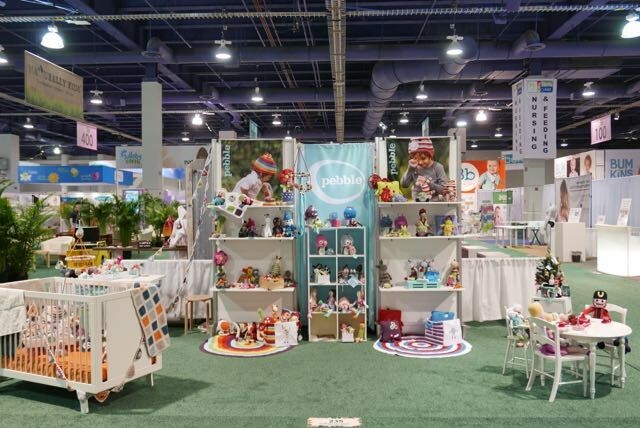 Pebble employs thousands of women in Bangladesh empowering women in ways which honor the rhythms of rural life and community.” It’s well worth the trip outside of the Global Handmade to see these products in booth 7043 in the Baby + Child section. “Fair Trade is about change: changing the lives of artisans, the economy, the way goods are produced,” writes Kayla Kidwell from Lucia’s Imports. “With this in mind, we introduce The Change Cuff in our Spring 2017 Collection. Each cuff’s closure features a Guatemalan coin, a piece of change, serving as a reminder to ‘Be the change you wish to see in the world.’ The Change Cuff is made by the talented young artisans at Elder Bead Shop, which offers financial support to the Santiago Elder Center. Many members of the Santiago Elder Center are women who were widowed during the Guatemalan Civil War (1960 to 1996).” You can find Lucia’s Imports in the Global Handmade section, booth 502. 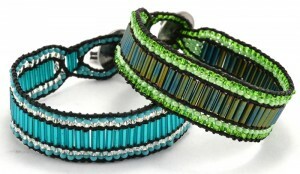 We just added some of the bracelets from Lucia’s Imports in the Global Crafts Showcase. “We have an entirely new line of both recycled and home decor items from Zimbabwe,” writes Leslie Mittelberg from Swahili Imports. These crested cranes are just one stunning design. “I was feeling the need for fresh ideas and to expand upon our existing list of countries in Africa. I loved the journey and what I saw during my stay there. Zimbabwe has an amazingly talented pool of artisans.” You’ll find these cranes wading in booth 423, Global Handmade. Textile products from India continue to flourish and Anchal Project brings a unique approach to reusing saris. “Anchal’s Narrative Collection explores the connection between vernacular imagery, heritage artwork and a maker’s journey to empowerment,” writes Natalie Hugon. 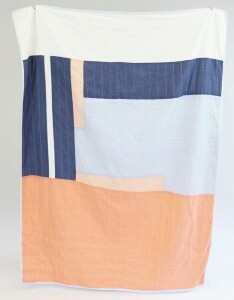 “The contemporary geometric design partnered with an aggregated stitch pattern revolutionizes traditional kantha quilting techniques. Each design is captured in a photograph and translated into a quilt’s compositional pattern, allowing variant stitch patterns to reveal the artisan’s process & determination. Every eco-friendly piece is hand-stitched with layers of 100% certified organic cotton.” Anchal Project can be found in booth #620 of Global Handmade. One of the reasons (okay, excuses) we use for why we don’t exhibit at trade shows is that we just have too many varieties of products. That doesn’t seem to be an issue with Harkiss Designs, whose products include everything East African. As a good accessory for fair trade clothing, you will want to check out the new line of sandals. Harriet Zaffoni writes “Our artisans create these chic sandals in the sunny climes of East Africa. Sturdy yet stunning leather designs combine with hand-beaded motifs to make this trend-friendly footwear a fine choice for spring through summer.” Harkiss Designs will be in booth 118, Global Handmade. Woven Promises is also thinking summer and warmer weather. “Our exquisite 100% Ethiopian cotton towels are entirely handmade in Addis Ababa,” writes Johnnie Segars. 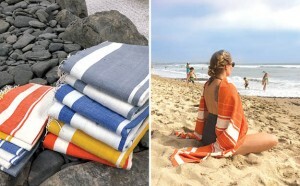 “These versatile pieces are soft, absorbent towels and also make great beach towels, picnic blankets, throws and sarongs. Our workshop creates positive work opportunities in Ethiopia, with an emphasis on employment for women.” They will be in booth 224, Global Handmade. If you usually visit Mr. Ellie Pooh’s booth for the elephant dung paper products for which the company has become renown, you’ll want to check out their other treasures. Filled with fabric critters rather than humans, this novel take on a doll house will no doubt become a child’s favorite toy. 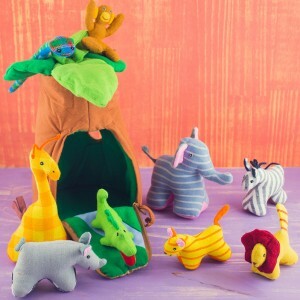 Mr. Ellie Pooh will be in booth #301, Global Handmade. “We’ll be introducing a new collection of our popular jewelry, including some super colorful statement pieces in our repurposed Kantha line,” write Kelly Weinberger of WorldFinds. “Our favorite so far is the Intertwining Kantha Necklace, but the Linear Arc Earrings and Braided Kantha Cuff are also doing really well Customers love this category for spring as each piece has its own unique, bright colors and patters, and all are handmade from recycled textiles. These sustainable styles are handmade by women artisans in India, who are improving their lives and communities through fair trade. Many of our items can be found in the Global Crafts Showcase too.” Thanks for the link opportunity, Kelly! 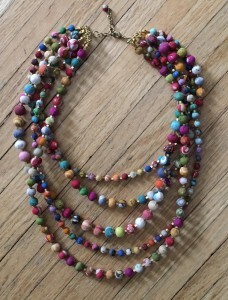 WorldFinds will be in booth 221, Global Handmade. I’ve always loved the carefree designs of the Mata Traders dresses. “We are so excited about our Spring/Summer 2017 Collection of clothing and jewelry,” writes Laura Mobley. “Not only is 2017 our 10 year anniversary as a company, but our new collection showcases a great mix of beachy blues and bright colored patterns. The Artsy Traveler dress in red (pictured here) is hand screen printed and handmade by our producers in India.” Mata Traders will be in booth 304, Global Handmade. Bridge For Africa has been working in rural African communities since 2003. 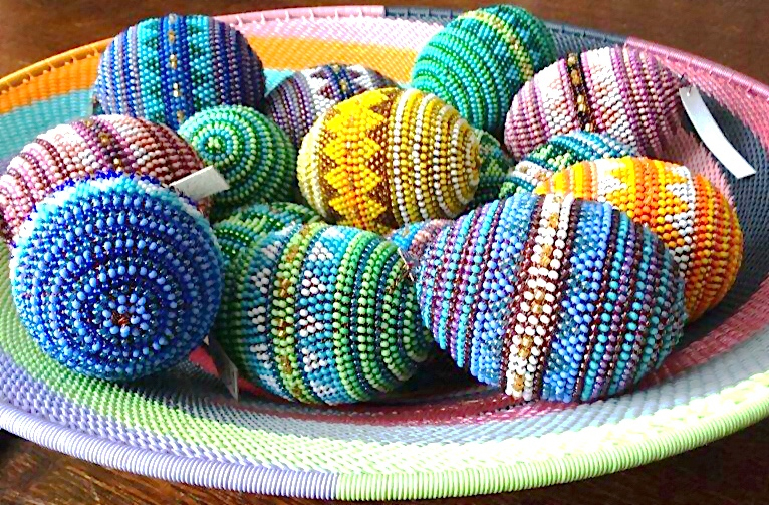 These beaded eggs are perfect for decorating year round. You’ll also find new basket designs from the traditional to contemporary. Find Bridge For Africa in booth 244, Global Handmade. If your a wholesaler exhibiting at the NY NOW show and would like to be featured in next week’s blog post, please get in touch with me. Last week’s Think Thursday post featured more fair trade exhibitors, if you missed it. And I’d love to do a blog on Fair Trade product reviews from those of you attending the NY NOW show — email me your reviews! ← What’s New at NY NOW?